Hooked on Needles: Cold Weather Crochet Project ~ Bargain Shopping! Cold Weather Crochet Project ~ Bargain Shopping! I've been on the lookout for an easy crochet afghan project to work on in between all my homework this fall, and I came upon THIS one from Lion Brand Yarn. Once I found the pattern I wanted to make, I kept my eyes open for a good deal on yarn. 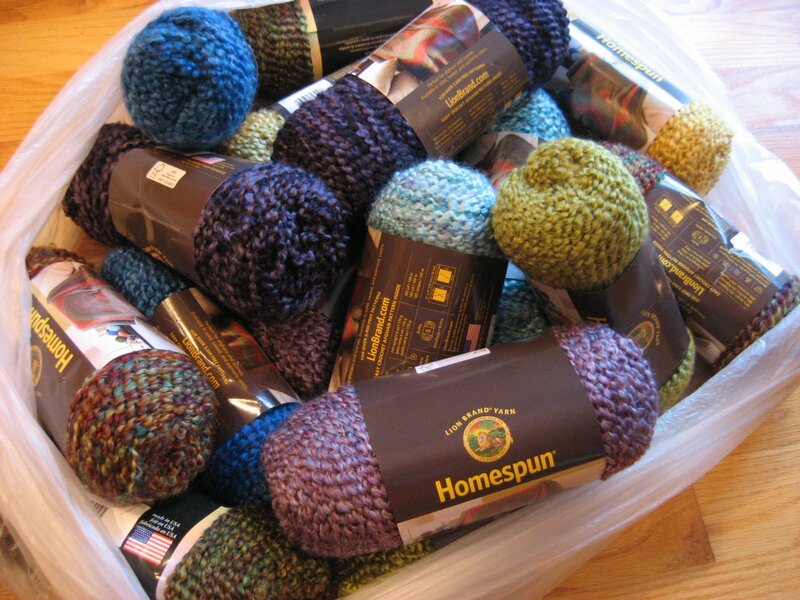 Homespun isn't cheap, well, I mean it is not inexpensive. I don't think it's cheap either, as in not good quality, but I'm talking price here. So today was the day to get a great deal on this yarn! 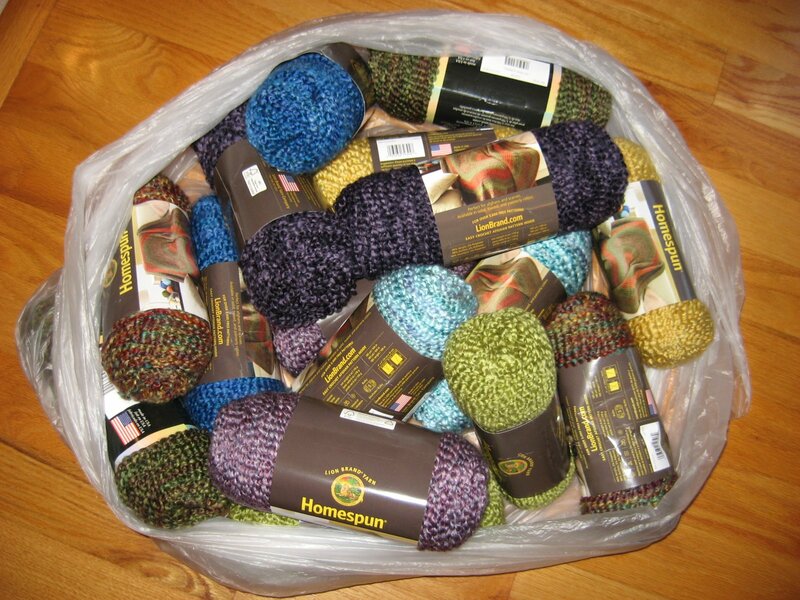 I bought sixteen skeins of Homespun, two each of eight different colors, which is just over $103 at regular retail price at Joann's. Guess how much I paid for all this yarn....go ahead, guess! You won't believe it! I paid just over $52 for 16 skeins of Homespun yarn! Oh boy oh boy, I do love a bargain! So if you've looked at the pattern I will be using, you're probably wondering why I bought two skeins of each color since the pattern only calls for two skeins of two colors and one of the other six. I thought the size was a little smaller than I like an afghan to be, so I charted out the design on paper and added one row and one column, and it turned out to be exactly seven squares of each color! So not only should I be able to use up almost all of this yarn in this one project, but it will be symmetrical having the same number of each color square! Whew! I really don't like block projects to have more of one and less of another, so this makes me happy! Do you have a cold weather project started yet? Your link does not take me to a pattern. Beautiful yarn though. If the link in the post does not take you right to the pattern, you may need to sign up for access to free patterns on the Lion Brand site first. It's free and only takes a minute, but it is well worth it because Lion Brand offers some really fabulous free patterns. Divine Knitted Scarf ~ Quick, Easy, No Pattern! Crocheted Swirling Bag ~ So Fun!